The Role of Our Atmosphere - What Keeps the Air in? The atmosphere protects us from being bashed by objects flying by in space. Just look at the moon! It is covered with craters from being hit by meteors – rocks or other matter passing by in space.
. That is because it has no atmosphere to protect it. Luckily for us, most meteors that would hit the Earth burn up in our atmosphere before they reach us. Ever see a shooting star? That is the atmosphere doing it’s job! The atmosphere also protects us from ultraviolet light from the sun. Ultraviolet light is a shorter wavelength than visible light, so we can’t see it. Though we do need some to be healthy, too much of it is bad for you and can cause skin cancer. The atmosphere lets just enough through to warm and feed us. It keeps us at the right temperature whether our side of the planet faces the sun on a summer day or faces away from the sun on a winter night. Life on Earth would not be as it is now if not for our precious atmosphere. The atmosphere blankets the Earth in layers. 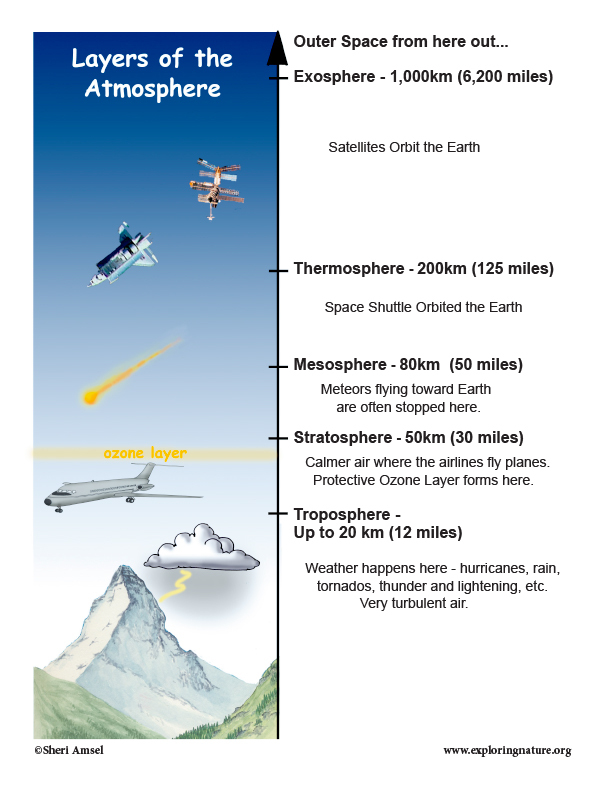 The layer we live in is called the troposphere. It reaches from the ground up 4 - 12 miles (6 - 20 km) into the sky. It is in this level of the atmosphere where all weather happens from hurricanes to lightning. It’s a wild and turbulent layer of the atmosphere. The next layer is the stratosphere. Here the air is much calmer. This is where the airlines fly their planes because the air is calmer and won’t make passengers sick. Ultraviolet radiation from the sun reacts with oxygen to form ozone gas in the stratosphere. This ozone gas helps filter out too much harmful radiation from the sun. This protective layer is called the “ozone layer.” In the last 25 years, chemical compounds called CFCs (chlorofluorocarbons that are in the aerosol sprays and refrigerants) have been destroying the ozone faster than it could be replaced. In 1978, the United States banned products that released CFCs into the atmosphere. Then in the early 1980s, an “ozone hole” was discovered over the Antarctic. In 1987 an international agreement called the Montreal Protocol was made between 180 nations to stop making and using the ozone-depleting gases. If countries enforce this agreement, maybe the ozone layer will recover over the next 50 years. Sometimes ozone is not a good thing to have around. When ozone forms on the ground from car exhaust, factories and chemicals mixing with strong sunlight and hot temperatures, it can be very harmful to people and other living things. It creates smog. Some cities have ozone alerts where they suggest that people stay indoors and not exercise when smog levels are high because it can cause serious respiratory problems. The next layer is the mesosphere. This layer stops most meteors as they fly toward Earth. All we see is the streak of light as they burn up as shooting stars. Thousands of meteors strike our atmosphere every day, but most of them burn up before ever reaching the Earth. The thermosphere is next in our outer atmosphere. This is where the space shuttle orbits the Earth. This is followed by the exosphere, the outer boundary of our atmosphere. It reaches to about 6,200 miles (1,000 km) above the Earth. This is the level of the atmosphere where our satellites orbit the earth. There are more than 3,000 satellites orbiting the Earth in the exosphere. Only about one third of them are still working. Scientists believe there are at least 10,000 more bits of junk and debris in orbit with the satellites. That’s a lot of junk in space!